Windy garden areas present a challenge to gardeners who want to landscape this difficult section of a yard. Windy locations usually lie in areas that aren't protected by the sheltering presence of a house, barn or shed. Plants for a windy garden must be tolerant of the actual wind and the growing conditions caused by excessive wind. Some plants rise to the challenge to provide consistent color and beauty in a windy location. Certain shrubs tolerate windy gardens to provide continual landscape color. 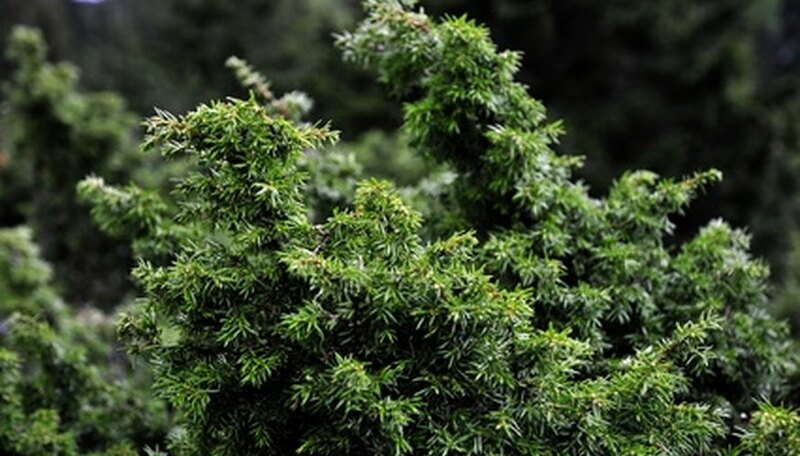 The juniper variety of plants features a rounded, spreading shrub suitable for windy locations. Juniper tolerates the dry soil conditions of this type of garden. Juniper grows in USDA hardiness zones 4 to 9 and reaches a mature spread of up to 25 feet, depending on the cultivar. Yearly pruning controls the spreading growth habit. Always check the mature growth size listed with each plant before purchasing this tough evergreen shrub. Ornamental grasses, such as feather reed grass, provide interest in the landscape as well as wind tolerance. This perennial grass can be used in gardens in zones 4 to 9. Feather reed grass grows upright up to 4 feet in narrow form in contrast to the clump-like cultivars of most grasses. Feather reed grass produce plumes shaded a light purple late in summer and medium-green blade foliage. These flowers gradually change to a light cream color with the approach of winter. This grass tolerates windy conditions and needs regular watering to remain healthy. Add compost or peat moss to the soil bed before planting to increase plant health and clump size. Plant feather reed grass in full sun to light shade locations for the best growing results. Check the cultivar when purchasing to determine suitability for the windy site. Gaillardia is a tough perennial suitable for windy locations. This plant grows in a mound up to 2 feet high and produces flowers ranging from yellow to bright orange. The daisy-like flowers lie well above the foliage at soil level. Gaillardia grows in a tidy mound and prefers full sun locations. This perennial tolerates dry soil, heavy rain and wind. This plant is often used at beaches along the dune line due to its wind tolerance. Gaillardia has a host of varieties suitable for use in zones 3 to 11. This plant attracts wildlife and produces consistent blooms throughout the summer growing months. Blooms are as tough as the plant and can be used as arrangement flowers.